I don’t know how 4 years have passed... In my mind I was just giving birth to this tiny fearless female. I vividly remember her kicking in my belly while I worked 10 hour days and thinking that she was going to be fiestier than her older brother. I knew her before I ever met her. So when I took her to a local baking boutique in search of the perfect sprinkles for her birthday cake, her personality helped me discover a new recipe for her cake. I took her into the store and we scoured their wide selection of pink sprinkles just to find the perfect one. We ended up with 3 tubs of sprinkles, because, well why pick just one!? But as we perused the many many aisles of baking supplies and decorations (my version of heaven) my spunky little one announced that she needed a princess cake and proceeded to point and talk loudly about every design and decoration they had. This sparked a conversation with the stranger standing patiently next to me. She told me how her daughter was exactly the same at this age and that not much has changed except for the fact that her daughter now bakes the cakes herself! This launched me in an idealistic image of me and my daughter spending many future afternoons baking together. Again, heavenly! But this lovely stranger also told me that she bakes a lot of kids birthday cakes and that she uses recipes from Edna De La Cruz. I have never heard of her, but she assured me her cakes come out perfect and delicious. So I kept that name in mind and rushed home to google her. Her website was intimidatingly filled with beautifully decorated wedding and birthday cakes, and their recipes. I read them all and discovered a strawberry cake recipe that sound right up my alley. 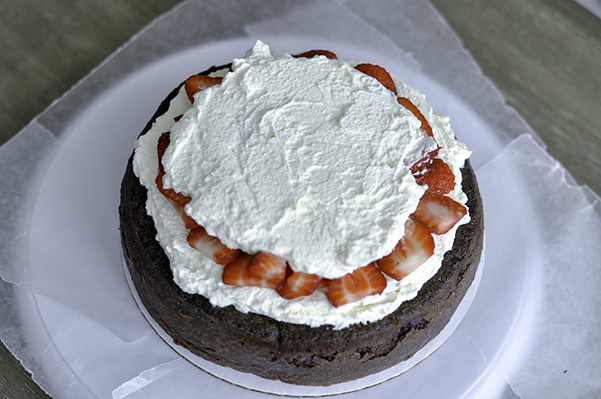 It used buttermilk and pureed strawberries to create a fluffy perfectly textured cake. I made my strawberry puree from scratch because I’m ridiculously extra that way, but it’s my daughter’s birthday, how could I not? It was actually pretty simple to do. I halved and hulled a pound of strawberries, added 3/4cup of sugar and let this macerate in the fridge overnight. Then throw it into a pot to boil for 2 minutes to dissolve the sugar and allow to cool. I them drained most of the syrup and pureed it in a food processor. This cake bakes up tall and fluffy with a nice flat top. The texture was soft and flavorful. I topped my cake with a mascarpone whipped cream and more sprinkles than I could ever imagine. I thew caution to the wind when I piled this sprinkles onto the sides of the cake. They look adorable but I seriously was vacuuming up non perils for days! Another tip is skip those expensive sprinkle mixes you find at specialty stores. They look super festive and cute in their glass jars, but you can make it just as easily yourself by combining three sprinkle shapes. 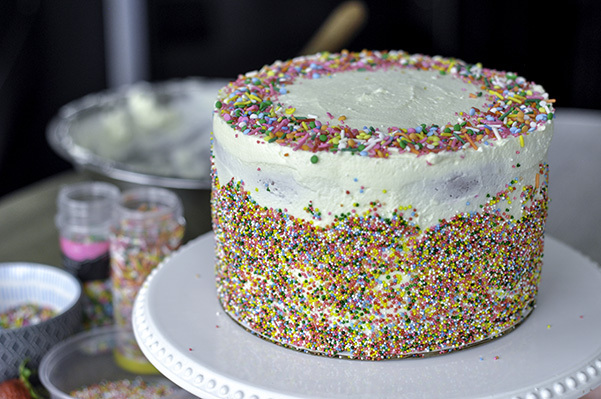 Just mix together one part cylindrical jimmy sprinkles with round confetti sprinkles and one part sparkly sanding sugar. My little one definitely enjoyed this cake as much as the adults did. Strawberry is her favorite flavor and this cake definitely delivered on both flavor, texture and child like whimsy. I can’t wait to make it again next year! Preheat oven to 350 F. Spray (or butter and flour). I used two 8x2 pans. Sift flour, baking powder. baking soda and salt into medium bowl. Set aside. In a clean dry grease free bowl, mix egg whites with a whisk attachment. Beat until peaks are stiff but not dry and add the 1/2 cup of sugar. In the bowl of an electric mixer, cream together butter and 1 1/2 cups sugar. Add eggs yolks one at a time, beating until well blended after each one. Add the vanilla. Mix in the dry ingredients in small additions, alternating with the buttermilk, beginning and ending with flour mixture. Fold in the pureed strawberries and mix in the food coloring if desired. I divided this batter in half and folded in different food coloring into each half. Fold the egg whites in the butter mixture, 1/3 at a time. Lower the oven temperature to 325 F. Bake cakes until tester inserted into center comes out clean, about 55 minutes. The amount of time really depends on the pans you use and your oven. Cool cakes in pans for 10 minutes. Turn cakes out and seal them in plastic well. Place the cakes in the refrigerator and let them cool well. I leave them at least over night.I recommend to eat the cake at room temperature. In a medium bowl stir together the mascarpone cheese, powdered sugar, vanilla, and salt. Mix until smooth, and set aside. In the bowl of an electric mixer beat heavy cream until peaks form. Fold the whipped cream into the mascarpone mixture until combined. Whip again slightly to add a little more air, then store in the fridge until ready to use.